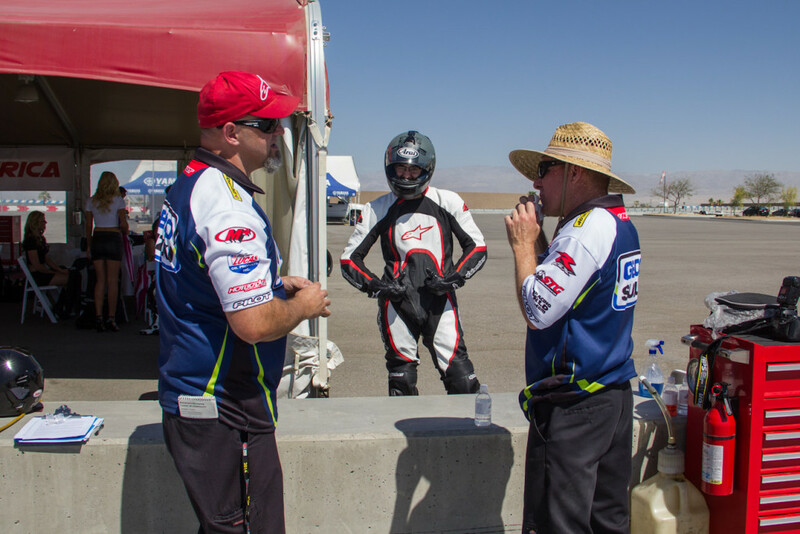 Recently, I had the pleasure of attending the MotoAmerica SuperBike experience event at the Thermal Club private track. Kahn Media got a great group of motorcycle journalists together to take part in both the Yamaha Champions Riding School session and Geico Suzuki Two Seat Superbike rides. 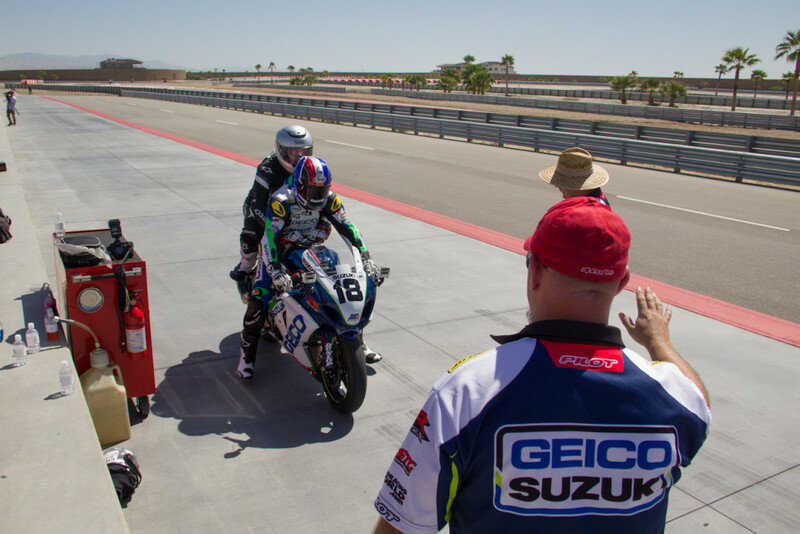 Because the two up ride I took with pro racer Chris Ulrich on the GSXR1000 superbike was one of the coolest things I’ve ever experienced… I had to give it a post all of it’s own. Having performed some 800+ two up rides, Chris Ulrich has a perfect history of providing passengers with a safe thrill. 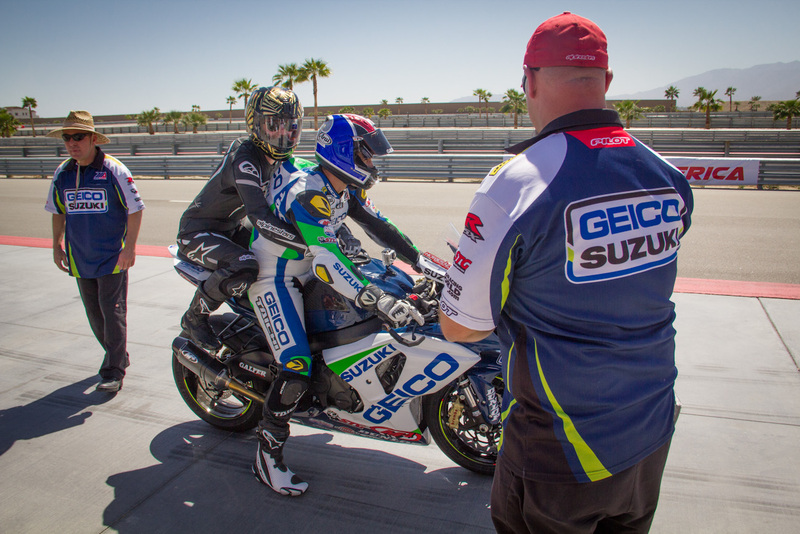 The Geico Suzuki Two Seat Ride team took signatures on liability waivers, paired everyone up with Alpinestars one-piece suits, boots, and gloves, and briefed us on proper two up riding etiquette. Keep your feet out of their way, hold on to the tank bar with a firm but relaxed grip, squeeze with your thighs to prevent slipping forward into rider, squeeze with your elbows to signal “holy crap too fast! !” etc. 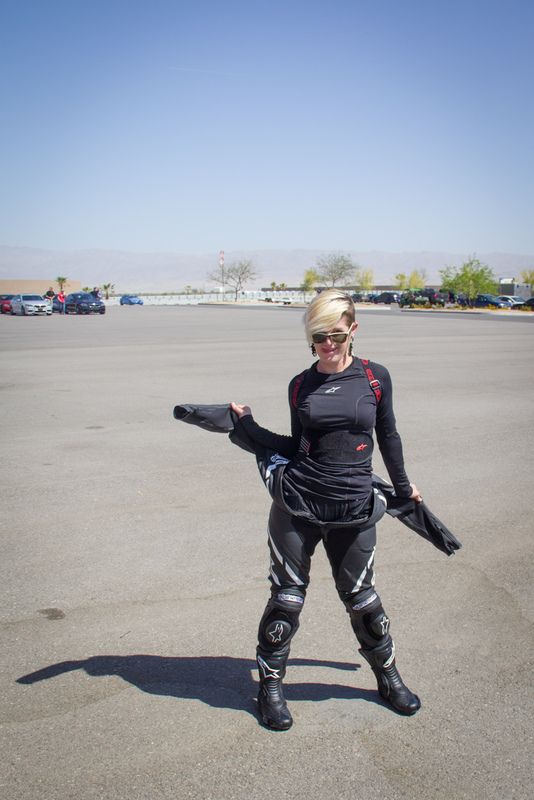 I suited up in the brand spankin’ new Alpinestars Stella Motegi suit, and hopped on back. Chris took off nice and smoothly, checking over his left before slipping onto the track and letting her rip. I felt my face enter into a sort of permanent grin, excited beyond belief. My entire body was covered in goosebumps from the anticipation. The first corners were pretty extreme, and he started off a little slow (probably my normal speed, ha) before cracking the throttle seamlessly into oblivion down the back straight. Wheelies at 100+ miles per hour are the most incredible and indescribable brilliance. My hands gripped the tank handle as my body was pushed back, my left foot flew off the foot peg, and I pulled weight onto my right foot and managed to get it back in place before the next corner. Chris’ knee down, both of us looking through the corner, it was a whole new perspective. Feeling the shift of the bike’s weight compared to Chris’, when he was moving his body, braking, accelerating and all. It was a lot to take in- every sense completely overloaded in the best way. Hunter S. Thompson put it into words best. “Faster, faster, until the thrill of speed overcomes the fear of death.” The controlled chaos of an insanely fast motorcycle rider is humbling and makes you think. The GSXR1000 superbikes Ulrich rides have been clocked at 196 mph, but because of the second person and track size, they said “we don’t expect you to exceed 170mph.” Oh, well then. When I asked about the average speed of the rides that day, I was told he was hitting the 150s. Now, I’ll admit… I’ve done the ton a time or two. I’ve done it plus some… plus quite a bit. Not that I make a habit out of crazy speeding for no reason and I’m not saying go get on your bike and go as fast as you can. That being said- this was a whole different feeling. First of all, you’re not giving the bike any real input- you’re just trying to hold on and be in a good position. So you feel like you’re on the back of a self piloting aircraft. Secondly, unless you’re a professional motorcycle racer, you don’t know what it feels like to go fast the right way. And lastly, track riding is a special kind of wonderful. When we exited the track Chris pat me a couple times and gave me a thumbs up, which I barely registered because my brain was doing backflips at the time. When I hopped off the bike I was literally yelling about how insanely amazing it was- there were not enough words, and they definitely weren’t loud enough. Heath Cofran of Alpinestars was laughing at me, but not in a bad way, more of a “I know right?!”. So, in summary, if you ever get the chance to do a two up ride with an experienced rider (I’d suggest an AMA sanctioned pro racer for full effect) don’t miss it! You will not regret the experience. This was proved by Wolf, my partner in mayhem and mischief, who is a tried and true vintage bike dude. He came with me to help me with photography, and had an opportunity to do the two up ride himself. He’s been on plenty of motorcycles, but racing and performance bikes are not his bag. I told him it would be worth it, so he tried it out. All he could really say is, “Holy crap that was crazy!” and “the tire coming off the ground at 100 is just insane!” He also agreed that it gave him some insight to how to be a better rider in general. By the way, being that this was my first time wearing a one piece suit (on a very hot day in the Palm Springs desert area of California), I have to say I’m impressed with how the Alpinestars Summer tech “underwear” and Stella Motegi suit breathe like a champ. Jeff Wolf & Chris Ulrich, photo from Kahn Media. Alpinestars suits, photo from Kahn Media. The biggest thanks to MotoAmerica for putting this together, Kahn Media for the invite, Chris Ulrich and the whole Geico Suzuki two up rides team for the unforgettable experience, Alpinestars for bringing out the big guns to make sure everyone was properly outfitted, and Wolf for attending and taking photos for me.